Last month I was able to reveal a little about the game project that I’ve been working on. Shares, retweets, favourites, +1’s and feedback via messages and email from many of you has been both positive and very encouraging – thank you! It seems that the ‘Project MSG’ logo made a strong impact. The response that I received, while not entirely unexpected, was rather more enthusiastic than anticipated. While I do concur that it’s a cool looking logo. And as the creator of this logo I would like to add that I do so in a humble and non-boisterous manner. What matters is that you love it! The logo has managed to convey and stir up strong nostalgic feelings of 8-bit & 16-bit gaming memories for you lot. As if the mid-80’s or even early 90’s were no longer some forgotten bygone era. I have no intention in ruining those feelings and you can all rest assured that the official logo will still retain this flavour. Fortunately, you didn’t just like the logo. There was a single screenshot of ‘stage 1-1’ of the game which managed to attain significant attention. Plus a fair amount in the twittersphere. Detailed pixel art graphics are gladly still welcome among retro game fans. This singular shot only gives a small glimpse of the game, but it’s enough to give a basic idea of the styling and gameplay. Defining this project becomes easier as work progresses. While the initial brief described it as 2D shooting game with a cyberpunk theme. This is still true for the project today. However, newer aspects start to surface that were faintly observed in the initial stages of development. Comparatively to, an alter ego of some kind, quietly hiding within the shadows of the dominant personality. Only to make itself known at a later date. Perhaps it all boils down to the aesthetic choices. The clashing of pixel art and FM-synth generated music, while a natural fit gives out a far more raw electronic feel. Due to modern development techniques and increased processing power, we have become accustomed to games that are incredibly slick and shiny. Nothing wrong with this intrinsically. After all, I’m all for high production values and polish in the creation of video games. It’s just that this added fidelity often constitutes in a loss of a raw edge. This rawness is ultimately part of the charm. It’s not just a retro-centric attribute that I’m pointing out here. It’s inherently punk in nature. Sticking out like a sore thumb, provoking the player that it’s nothing like those big-budget, overproduced but somehow sterile games. 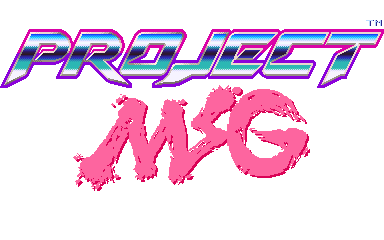 Project MSG wants to get dirty! If you want it really dirty, simulate sprite flicker and slow-down when too many enemies get lined up. Maybe it could be turned off in the options. Also I’ve noticed a lot of “retro” pixel art games using non-uniform pixel sizes, 8-bit alpha and unlimited color palettes. Unless the SNES is being emulated that’s not an accurate representation of 8-bit games’ graphics capabilities. Once again, thanks for your input Kevin. You put forward some good points. Right now the game is locked at 60 fps and it plays great. However sprite flicker and slow-down are considerations should they be beneficial to the overall experience. I’m working with Capcom’s CP System board specs in mind. Not 100% accurate but as close as can be. Your observation on non-uniform pixel sizes is correct. Most indie developers who are making retro style games often have to support different platforms with widely different displays & aspect ratios. The image will often be stretched, either on the horizontal or vertical axis…or both to avoid large borders which many gamers hate. Unless actual vintage hardware is targeted, the above issue will most always present itself.